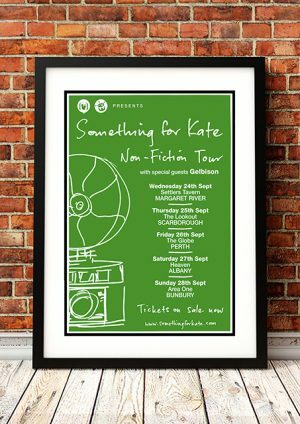 Classic Something For Kate Band Concert Posters and Memorabilia! Buy Online Now! Something for Kate’s confessional post-grunge grandeur has made the group a strong favorite with Australian alternate rock fans. The group’s music revolves around the words and emotions of singer/guitarist Paul Dempsey. On stage he stands at the microphone, guitar in hand, carefully dreaming out loud his evocative image-ridden lyrics. Even when the band’s atmospheric backings build to their powerful climaxes, you can hear every word. Audiences listen or sing along to the hook-laden melodies, playing their own mind-movies as they do so. The band was formed in Melbourne in 1993 when Paul Dempsey (vocals, guitars, songs) and Clint Hyndman (drums) met at school and connected musically. The name Something for Kate comes from a note someone left on the kitchen table one day. 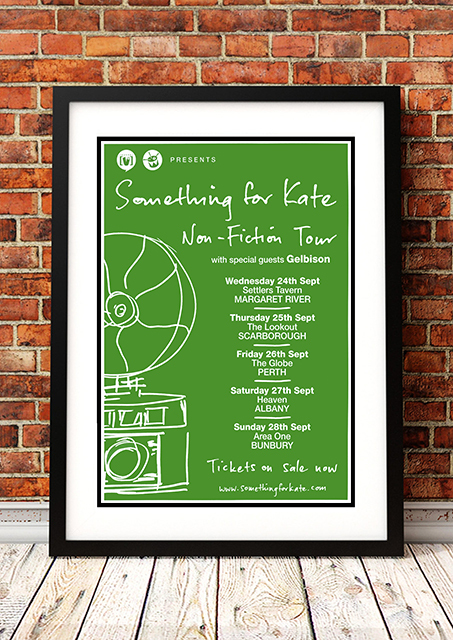 We stock some awesome Something For Kate Band Concert Posters.